Pierate - Pie Reviews: Who will eat all the pies? Who will eat all the pies? That is the question being asked as we prepare for the first ever Pierate Pie Contest in a couple of weeks time! The hall (with kitchen!) 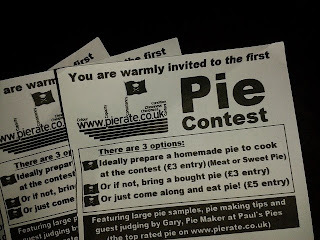 is booked and there are rumours in the air of people practising their pie recipes, as plans are being finalised for the Birmingham Pierate Pie Contest. Even the Pierateers themselves are making an entry, though they want to categorically confirm that they are more pie eaters than pie makers! Though to mix things up a bit, they are planning to make a “Beast from the East (side of Africa)” pie – make of that what you will! And to whet people’s appetite even more, the exciting news is that Gary, who works for Paul’s Pies, will be there to share his fine, high scoring pies and help with the judging of this informal pie contest. We’re looking forward to tucking into some top pie, discussing the fine arts of pie making and reviewing and seeing what the people of Birmingham have to offer the pie world! Oh, and knowing us, we’ll have a bit of pun and games along the way! Of course, photos and reaction will be making their way on to the @pierateers twitter feed and there will be feedback right here on the number one pie reviewing blog! Keep your pies peeled for that!